Ursa Minor Jeep JK hard top conversion J180. 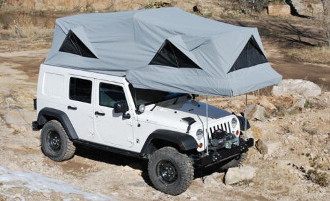 This version of the Ursa Minor replacement hard top incorporates a fold-over tent camper for up to four adults. Bed platform opens over hood of vehicle for minimal footprint. Over 7' standing room in access way when open, 48" headroom in tent, and 56 square feet of living space. Access into tent from inside or outside of the vehicle. Quick, easy set up/take down from exterior with torsion spring assist. Tough, breathable, fade and water resistant Australian Coolahba canvas tent. Panoramic views and ventilation with zippered screened windows on all four sides, and zippered doors on the side. Front Interior headliner of the J180 and J30 can have 12 volt or USB outlets added, and further organized with the Navigator option. This option allows for flat multi-use storage for CDs, maps, charts or an atlas, and even small items such business cards. The tent has mesh on all sides, backed by canvas for rainy days. With the hatch panels in place, the bed is 7 feet x 4 feet wide. The access way is covered by two hatch panels, which can be pivoted up to let one person out while another person is still sleeping. One or both hatch panels can be completely removed for standing room. Jeep Hard Top - Rear Interior, solid rear quarter: The interior of the shell is lined with a durable black carpet. The rear shell can be ordered with or without the rear quarter glass. Production of the camper assembly starts with payment of a non-refundable 10% down payment via Visa, MasterCard or check. Reciept of deposit initiates production and unique configuration of your camper order. We are committed to building high-quality campers that exceed expectations. The turn-around for an order ranges from 6- 8 weeks from payment of deposit, depending on season and our backlog. Once an order is placed , we'll confirm a date for shipment or installation so you can make plans. We can install your top at our facility.